Elaine Hancock (Olney, United States) on 13 September 2013 in Art & Design. Exhibit at the Hirschhorn Museum in Washington, DC. I like the way the paint running adds to the pot. Nice photo. Agree with Bruce - that simple 'ploy' is very effective. Very. You filled the frame well to concentrate the viewer's eyes with colour. Very good combination of colors. Good view! I also like the shape of ceramic. Magnifique composition et couleurs lumineuses! Superbe. Un super cadrage et un ebelle photo! I like, particularly the general textures, and the color of the bottom right one, which I'm in love with. très coloré et belle lumière. Superb composition and vibrant colour - love it! Beautiful composition of this colorful display!! 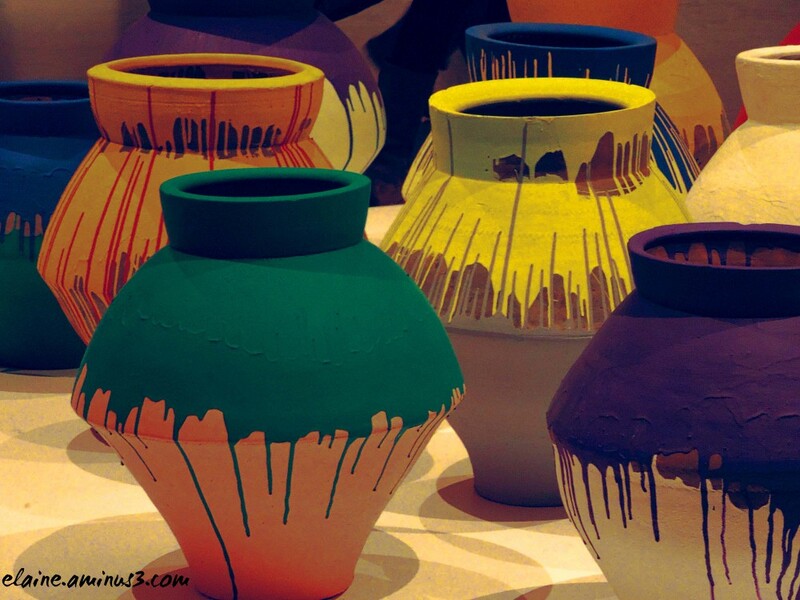 Looks like a simple way to create such eye-catching and colorful pots!! I love how they have allowed the drip lines to dry, making each one unique. A fine capture of the unique styles and painted decoration of these pots. A colourful collection! It makes a magnificent picture! Excellent! Superbes poteries et couleur quel dessin t belles formes. How beautifully you have composed this image. I love this point of view, the colors and patterns you have captured. These are beautiful, and your framing both represents them and abstracts their shape/colors. Love it ! Colors colors ! !